The flint artefacts discovered in Egypt show the same design as those of the European Old Palaeolithic civilisation (Chellean, Achaean, Mousterian). In the Late Palaeolithic Period there was an own development with differences in Upper, Middle and Lower Egypt. The Neolithic Period started in the fifth millennium BC (Fayum, Merimde): the houses were oval in shape, the pottery monochrome; the first maces and palettes are found, as well as the first human and animal figures in clay. The fourth millennium pre-dynastic cultures of Upper Egypt (southern Egypt) are known from cemeteries in particular (Tasian, Badarian, Amratian, Gerzean); of Lower Egypt (northern Egypt) the town culture of Maadi. The natural riches of the country were used: stone for the manufacture of vessels, sculpture, maces and palettes; metals for tools, weapons and decorations; minerals for paints; clay for pottery and sculpture, and ash bricks for the building of tombs and dwellings; bone and ivory for sculpture, knife handles and toilet articles. 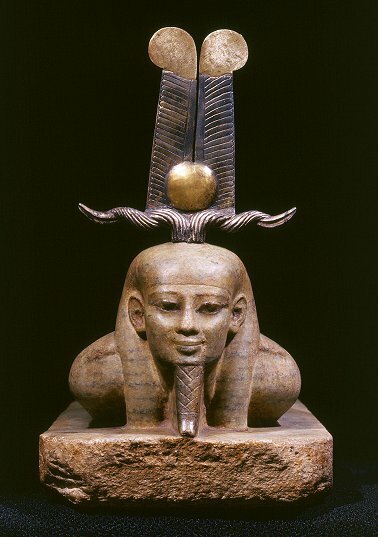 The culture of Upper Egypt was the first pinnacle in the history of Egyptian civilisation. Domestic architecture developed from round huts to oblong buildings of stone, and the oval tomb became oblong. From the end of this period dates a royal tomb at Hierakonpolis with some of the oldest wall paintings. Characteristic Tasian pottery include cups with carved geometric decorations; from Badari comes pottery decorated with comb stripes; from Amra red pottery with white geometric figurative paintings; from Gerzah pottery with red figures of humans, animals, plants and ships on a light background. The Amra culture knew sculpture, for instance female figures with broad hips – the head in the form of a bird's beak, and carved bearded male heads at the tip of a hippopotamus tooth. In the Gerzah period the flint industry reached its zenith in knives with wavy decorations. Reliefs were carved on knife handles of ivory, pear-shaped maces and commemorative tablets of slate. At the end of this period and at the beginning of the Historic Period (about 2800 BC) a victory pallet of King Narmer was erected, immortalising his victory over the delta region.